Originally published for Spirit, the Gonzaga Faculty and Staff Newsletter (September 2017), this message conveys much of the tension and the action and the passion on our campus surrounding the issues of diversity, equity and inclusion. The struggle is real – not only at Gonzaga but on campuses across America. Dr. Reyes eloquently expresses the heart of the matter in a Jesuit tradition and shares updates being made at Gonzaga to work toward deepening our intercultural fluency. the father of Gestalt Therapy, when he noted that in cultural relationships we enter a matrix that invites the potential experience of “through the face of another, I am.” A Hawaiian elder once told me that Hendrix may have been referencing the notion that “you spot it, you got it.” Here is what I see reflecting back to me and what I hope I know as I begin my 30th year at Gonzaga. student body just south of 8,000 being served by a workforce of approximately 1,440 staff, faculty and administrators. Imagine this: Each student, staff, faculty and administrator embodies a cultural world unto themselves. with a dose of idealism to manifest into reality. For academic year 2017-18, I would like to see us experience the spiritual significance of human diversity by linking practices of inclusion, equity and intercultural awareness to our educational mission as a Jesuit social apostolate. One of the hallmarks of Jesuit education, based upon Ignatian spirituality, is the belief that God can be found in all things because the world is saturated with divine presence. He describes a cultural reality wherein every moment of our life God is communicating to us through person, place and thing. The Composer of Grace and Keeper of Promises is constantly trying to draw us into an awareness of the reality of who we are through His eyes and our experience of “the other.” I would like to challenge all of us to raise our awareness of the “active presence of God” in all our intercultural relationships. Can you see the other through God’s eyes? Where there is a will, there is a way. Will a College Democrat see a College Republican through God’s eyes and vice versa? Will a heterosexual staff or faculty see a gay, lesbian, transgender or questioning staff or faculty through God’s eyes and vice versa? 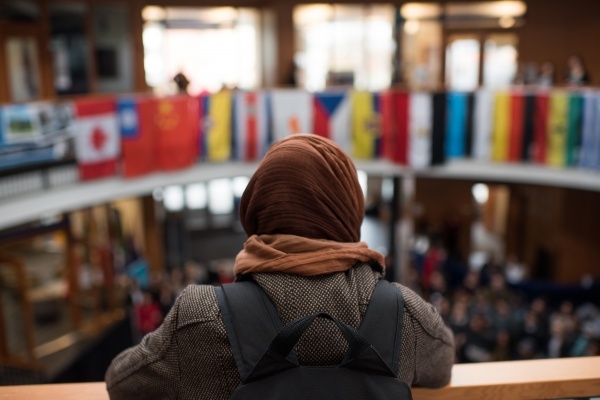 Will a Christian staff see a Muslim student through God’s eyes? Will an able bodied student, faculty or staff see a physically challenged student, faculty or staff through God’s eyes? These are questions with potential answers inviting us to close the gap between the promise and the practice of culturally inclusive teaching, or recruiting and retaining a diverse workforce, or creating a safe, supportive campus climate for everyone. graduates to serve and thrive in a culturally diverse world. What makes diversity work distinctive at GU compared to other regional institutions of higher learning? Here is the image I see in the room full of mirrors called Gonzaga University. The spirit of a Zag, the soul of a Bulldog is nurtured by the invitation to become a contemplative in action. At Gonzaga, in every moment of our community life as students, faculty, staff and administrators, we are invited to be alert and vigilant to God’s presence in all our relationships. We are blessed with the choice to use this awareness of our intercultural relationships for a greater good by actively addressing issues of social justice as it pertains to exclusion, oppression or marginalization. Inclusion Cultural Engagement (DICE) colleagues, through UMEC and LGBTQ+, have been doing and continue to do for the greater good. I offer a heartfelt welcome to Joan Iva Fawcett as assistant dean and Ricardo Ortega, as program manager, new colleagues with DICE. You gift me with hope. Gratitude comes from how truly grateful I am to our student activists who remind me that a Jesuit university is a catalyst and container for creative tension and loyal opposition, where truth is achieved through dialogue and the miracle of listening. You teach me that listening is the midwife of action. our inclusion and equity challenges and opportunities. universal design pedagogies aligned with equity education practices. Art & Sciences. This is an initiative designed to develop a more culturally diverse faculty. We are implementing a Bias Incident Assessment and Support (B.I.A.S.) team. improve the reporting of, and response to critical incidents. programs such as the International Conference on Hate Studies, Oct. 19-21.
of all our intercultural relatives. In the Spirit of Our Ancestors, May the Blessings Be!